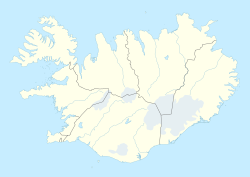 Keflavík (pronoonced [ˈcʰɛplaˌviːk] ( listen), meanin Driftwid Bay) is a toun in the Reykjanes region in soothwast Iceland. As o 2016, its population when combined wi the nearby toun Njarðvík, is 15,129. ↑ "Population by Locaties-Keflavík and Njarðvík". Retrieved 28 July 2016. This page wis last eeditit on 20 Apryle 2017, at 03:38.